Amex cards have always been more expensive to accept, but choosing the right payment processor can turn the premium cards into a strategic choice for your business. Processing Amex does usually cost more than Visa or Mastercard, but the higher costs may be worthwhile for your business. Amex is making a big push for merchant acceptance, especially among small businesses, and they're dropping fees to make it happen. Choosing the right payment processor for your business can save you money on accepting American Express transactions. It's true that Amex charges higher fees than the other networks. Usually, the networks and issuing banks together take between 1.5-2% of a given swipe transaction. (Higher for online transactions due to the risk of fraud priced in.) American Express has a more vertically integrated business model, and they have historically capitalized on their market power and prime consumers with higher fees, approaching 4% of the transaction. These fees have allowed them to offer rich travel rewards and benefits to their cardholders. And speaking of those cardholders, they're the reason to accept American Express cards. They tend to be more affluent, have higher credit scores, and spend more on average than customers with other cards. Welcoming Amex customers means welcoming larger sales and attracting high-value customers. And there are ways to do it without taking a big haircut on margins. Meet the New, More Merchant-Friendly American Express. The last three years have been a pivotal time for American Express. After 16 years, Costco switched from Amex to Visa as their sole accepted card network in US warehouses. At the same time on the consumer side, Chase Bank and others introduced competitive travel rewards cards. Amex is facing more competition than ever, and they've identified low merchant acceptance as an area to improve. They've cut fees and started programs to help small businesses, both as users of their OPEN cards and with "shop local" rewards campaigns. These days, they trumpet the fact that over 1 million merchants in the United States have started accepting American Express cards in the last year. With cardholders who make prime customers, a renewed focus on improving their appeal to merchants, and fees on a downward trend, accepting American Express cards is a good decision for most businesses. Which kind of processor gives you the best deal for accepting American Express cards? I pulled pricing estimates for 3 processing companies with different pricing models to illustrate the difference. Imagine our model small business processes $30k per month with about $24. 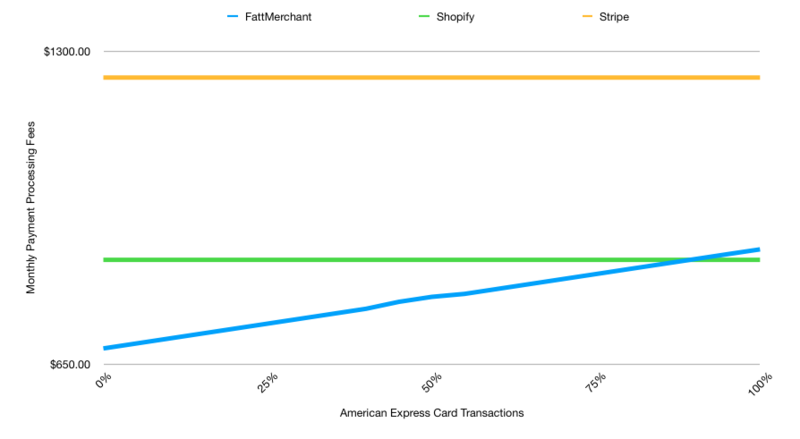 Stripe charges 2.9% + $0.30 per transaction, but that's top of market, even with lots of American Express exposure. "Interchange Plus" type processors like Dharma Merchant Services offer lower transaction fees, but usually, vary by card type. "Subscription" products like this one from FattMerchant expose you to the underlying cost of processing each transaction and keep a modest transaction fee with a lower monthly cost. You can see that Amex is more expensive than Visa and Mastercard by the way the line trends up, but you can also tell that flat-rate processors like Stripe and Shopify build in a healthy profit margin for themselves on Visa and Mastercard to paper over any loss on Amex. Very few merchants see 90%+ of their volume in American Express cards; 10-30% is more normal. While processing Amex cards may be more expensive, you lose money on every non-amex transaction with a flat fee processor. Of course, the simulation above is just a model. Want to compare monthly pricing for your business across dozens of processors, not just 3? Click over to our payments explorer, and we'll instantly estimate your costs and find you the best payment processor for your business.